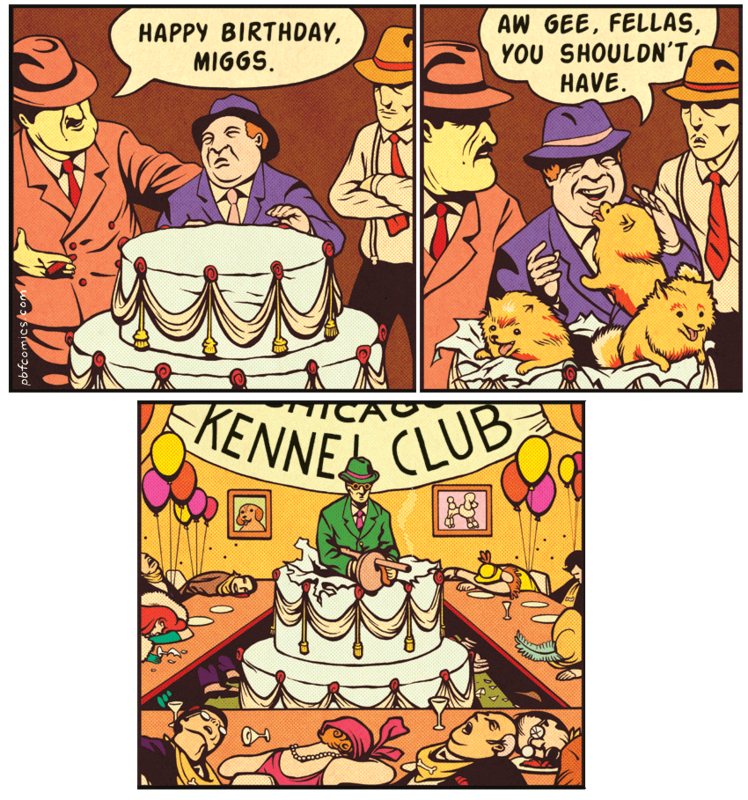 Sometimes I think PBF guy tries to convey way too much in three frames, but I love him still. Last edited by Necrometer on Thu Nov 17, 2011 1:27 pm, edited 1 time in total. Hahaha. Thats why I'm a cat lover. About 5 seconds to notice the cake switch. Ha. i dont get whats not to get? frame 3 doesn't take place at the same local as frame 1 and 2. frame 3 is the two gangsters making up for their "mistake"
hahahhh that is pretty good. Yes, it took like 3 seconds to get. 51[V][V]f0C wrote: frame 3 doesn't take place at the same local as frame 1 and 2. frame 3 is the two gangsters making up for their "mistake"
Nope: tragic mix-up at the giant cake delivery service. You fail. This explanation makes the cartoon totally not funny. that's definitely one of the better web comics out there. yeah, thats how explaining a joke always works out. it's only funny if you can figure it out yourself. Yeah, I had to look twice. hey heresy - where did you get your piggy avatar? Is your avatar a brewing yeast spore, Tom? 51[V][V]f0C wrote: yeah, thats how explaining a joke always works out. it's only funny if you can figure it out yourself. Hahahaha I knew you would make an excuse! Good ol' Thor. Geeheeb wrote: Is your avatar a brewing yeast spore, Tom? good eye. sad to say, I didn't put it up there because of the brewing implications. I have been working on a project where I am building an historical exhibit for the Biology Department on campus and one of the things I did was make a composite of the model organisms used in genetic research. Saccharomyces cerevisiae happens to be one and I really liked the image. i don't find it funny, but i think that's may be because i don't have a sense of humor. nick wrote: i don't find it funny, but i think that's may be because i don't have a sense of humor. obviously. you're always the guy who gets butthurt if people post 4chan stuffs on this bored, aren't you? is this one funny? the jar obviously popped, that means it wasn't opened before. i don't get it. Ha! It did take me a little bit to get it, but yeah, it's pretty funny. It says "Button will pop if seal is broken" on the top of her lid in the 3rd panel. This one is sort of flawed I think... my take is that his intention was that the top half of the second panel is PB's expectation of what should happen, then when he hears no POP, he's furious. It's tough to draw silence, right? Wait... whoa... just REALLY read what Pisscubes said that's insane. What sort of button pops if opened? Bad move, comic guy. Last edited by Necrometer on Thu Dec 06, 2007 9:40 am, edited 1 time in total.